Optical coherence tomography OCT as a non-invasive, 3D, micro-resolution imaging modality can be used to to image human skin in vivo and to assess the skin abnormalities, pathologies and conditions. Figure 1: 3D visualisation of an in vivo OCT image of the skin of a volunteer’s forearm. 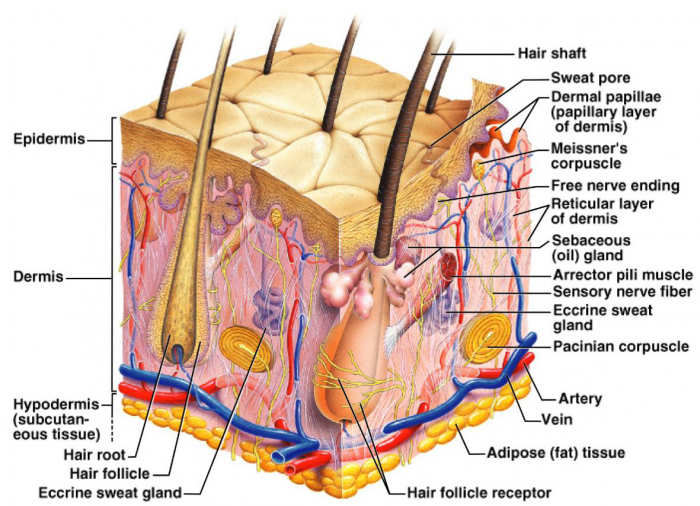 Stratum corneum, epidermis, dermo-epidermal junction, blood vessels, sweat ducts, sebaceous glands and hair follicles. Abnormal scarring is a common pathological outcome after burn injury, which can lead to severe cosmetic and functional defects to the injured organ. We have active research projects undertaking pilot and longitudinal studies over time and running clinical trials in collaboration with clinicians, performing OCT imaging on skin of volunteered burn scar patients [1, 2]. Our goal is to study the potential of OCT imaging as an objective tool objective for assessing of pathology of burn scars. After an injury, tissue regrowth and remodelling processes, primarily through the synthesis of both blood vessels and collagen fibres to close the wound, form scars A common feature of abnormal scarring is angiogenesis, the formation of new vasculature throughout the scar tissue. This causes the scar to appear red and inflamed. The short acquisition time of OCT image frames make it possible to track displacement of moving blood cells inside vessel walls to generate microvasculature maps of skin. Figure 2 shows the results of the assessment of OCT microvasculature maps of an abnormal burn scar and the contralateral normal skin in a patient. This figure also illustrates the results of our developed automated quantification techniques of vascularity, through representing the area density and the distribution of the diameter of the blood vessels in the maximum projection maps (MIPs) of microvasculature. Figure 2: (a) 12-month-old pathological scar; and (b) the contralateral normal skin. En face MIPs of the vasculature over a physical depth of ∼600 μm are shown in (c) and (d). The physical depths (μm) of the vessels in (c) and (d) are color-coded, respectively, in (e) and (f). Histograms of blood vessel diameter measurements and other quantification results are shown in (g). Scale bar indicates a distance of 0.5 mm. Synthesis of collagen fibres in excess also can result in the development of pathological scarring. The microscopic structure of the cells and extracellular matrix in scar tissue is below the resolution of many OCT systems. However, we have quantified the impact of these microstructures through parametric imaging. In parametric imaging, we use automated techniques to extract absolute values for optical properties of the tissue. This is then presented as a visual map, where the value of each pixel is specified by the corresponding property of the tissue at that location. Figure 3 shows the utility of two forms of parametric imaging for scar assessment. The first is the optical attenuation coefficient, which provides an indicator of cellular and extracellular composition . The second is the birefringence of the tissue, which is indicative of the organisation of the collagen fibres in the scar. Figure 3: Case study of the attenuation coefficient of a pathological scar: (a) and (b) Photographs of the contralateral normal skin and scar, respectively. (c) and (d) Vasculature MIPs of the normal skin and scar in (a) and (b), respectively. (e) and (f) En face attenuation coefficient (mm−1) maps of normal skin and scar (1 × 1 mm), respectively. (g) Histogram of attenuation coefficients for normal skin and scar. (e) and (f) En face birefringence (mm−1) maps of normal skin and scar (1 × 1 mm), respectively. (g) Histogram of birefringence coefficients for normal skin and scar. The pathologies of skin often modify its mechanical properties. Clinicians commonly manually palpate skin lesions to obtain a subjective assessment of the pathology. We have applied optical palpation, a tactile imaging technique based on OCT, in vivo to assess the mechanical properties of skin lesions. Using this tactile imaging technique, a map of stress is generated at the skin surface, analogous to the stress detected by manual palpation, but at a higher resolution. Figure 4 shows the results of applying optical palpation on the burn scar of the forearm of a volunteer. The acquired stress map in Fig. 4(c) shows: higher stress over the burn scar than over the surrounding skin and clearer delineation of the scar than the corresponding en face OCT image (Fig. 4(b)). Yih Miin Liew et al., “Reduction of image artifacts in three-dimensional optical coherence tomography of skin in vivo,” Journal of Biomedical Optics 16(11), (2011). Yih Miin Liew et al., “Motion correction of in vivo three-dimensional optical coherence tomography of human skin using a fiducial marker,” Biomedical Optics Express 3(8), 1774-1786 (2012). 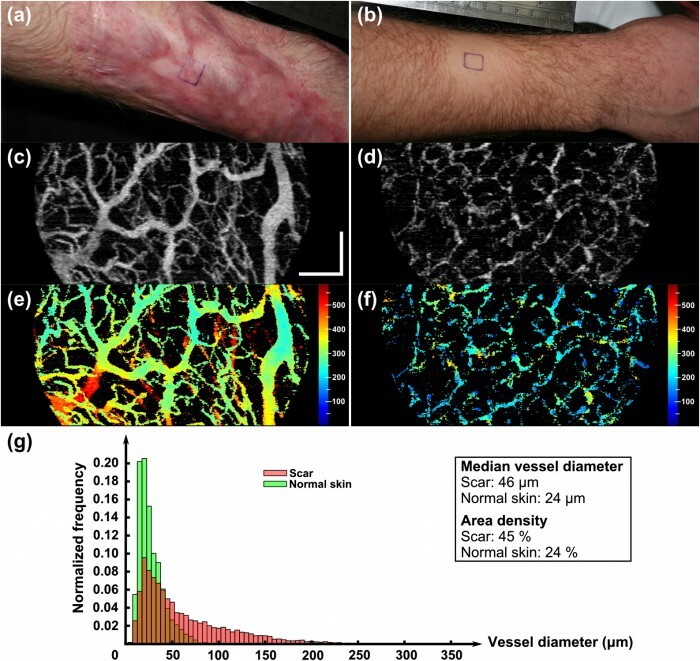 Yih Miin Liew et al., “In vivo assessment of human burn scars through automated quantification of vascularity using optical coherence tomography (vol 18, 061213, 2013),” Journal of Biomedical Optics 18(6), (2013). 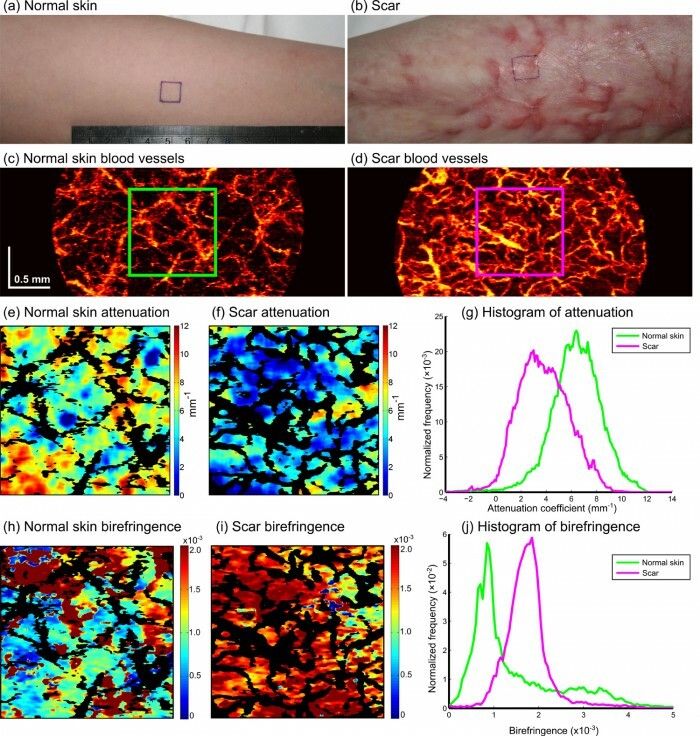 Peijun J. Gong et al., “Assessment of human burn scars with optical coherence tomography by imaging the attenuation coefficient of tissue after vascular masking,” Journal of Biomedical Optics 19(2), 10 (2014).